These are made with coconut yoghurt & are quick & easy to make with out compromising on delicious flavour. The combination of strawberry & mint work perfectly & both adults & children love them! 450g strawberries, rinsed, hulled & chopped into small pieces. Put the strawberries, lemon juice & coconut sugar in a pan & warm gently, mixing well. Mash the strawberries with the back of a wooden spoon as the sugar dissolves & the mixer warms. Leave to cool. Mix together the yogurt & chopped mint in a bowl, then gently stir into the strawberry mixture. Put all the ingredients into a food processor until you have a smooth texture. Spoon the yoghurt mixture into a freezer- proof container & freeze for at least 3 hours, preferably over night. When ready to serve, take the container out of the freezer & leave for a few minutes to allow the iced yogurt to soften so it is easy to scoop out. 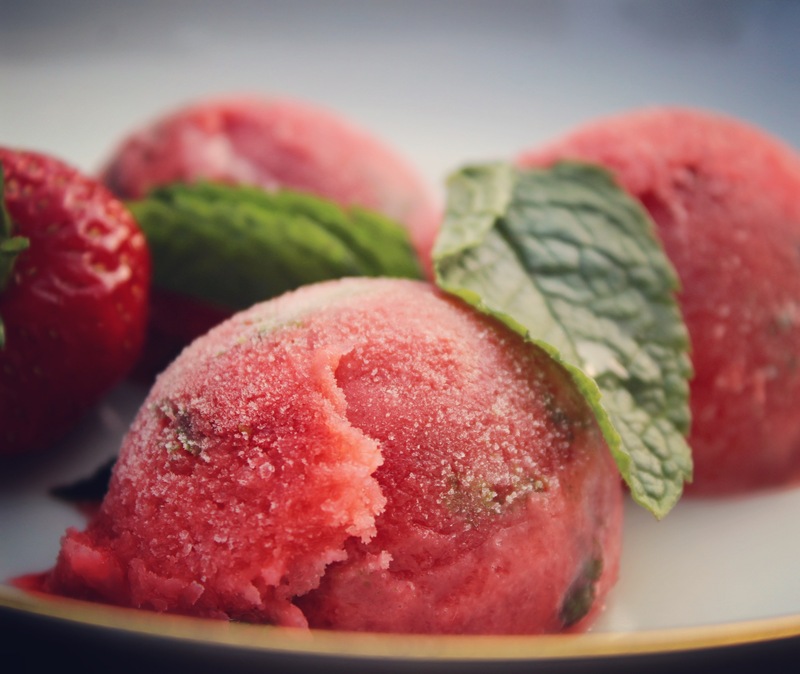 Serve in ice cream cones or bowls with more fresh strawberries. Strawberries are packed with vitamins, fibre, & are particularly high in antioxidants such as flavonoids & phytonutrients, which give the strawberries their bright red colour. They are a good source of manganese, potassium, vitamins C & K & Folic acid. They have been used throughout history in a medicinal context to help with digestive ailments, teeth whitening & skin irritations. Their fibre & fructose content may help regulate blood sugar levels by slowing digestion & the fibre is thought to have a satiating effect. Fresh mint is a wonderful calming & soothing herb. It has many health benefits including aiding digestion, treating dizziness, treating nausea, & treating headaches & much more. Mint leaves provide a unique fragrance & midly sweet flavour that has a cool after taste. They also contain folate, niacin, thiamin, vitamin A, potassium, calcium, copper, iron, magnesium, manganese & zinc. Coconut sugar has a lower glycemix index to regular table sugar & also benefits from trace minerals, antioxidants & fibre. However please note eating too much sugar of any kind is not something I recommend. However coconut sugar is definitely a better choice if you are wanting a better alternative. Coconut yoghurt is a great dairy substitute as it is packed with healthy fats, rich in antioxidants & contains fibre. I used Koko in this recipe because it also contains probiotics, which help to balance the microflora in the gut & aids your digestion. This delicious dessert is dairy & gluten free, it also is incredibly refreshing & simple to make.